Based on records where his name appears, he preferred to be known as L. Wilson Davis (1862-1947), but Leonidas was his full first name. Thanks to the thorough work of family historian and cemetery researcher Glenn Wallace, I was able to find Dr. Leonidas Wilson Davis’ grave in Monocacy Cemetery, Beallsville, Montgomery County, Md., and from there, his family history unfolded. Dr. Davis was the son of Frederick County, Maryland farmer Isaac Howard Davis (1818-1901) and Catherine (Miles) Davis (1822-1897). L. Wilson Davis was a member of the University of Maryland Dental Department class of 1888, along with Frank Ryland Steel. He set up practice in Baltimore, and married Mary Harrison Griffith, daughter of merchant and Civil War veteran Francis Moore Griffith (1831-1908) and Elizabeth (Dickerson) Griffith of Beallsville, Montgomery County, Md. Dr. Davis was interested in what became known as orthodontia, as well as the care of teeth as a public health concern. In 1900, he was part of a committee that authored a proposal for a pilot project for the examination of children’s teeth in Maryland schools, and for the education of children in dental hygiene. Dr. Davis’ brother, Isaac Howard Davis Jr. (1859-1918), also became a dentist as well as an MD. Isaac Davis was part of the University of Maryland Department of Dentistry’s first graduating class in 1884, and was a professor of dentistry at the University of Maryland at the same time as Dr. John C. Uhler and Dr. James H. Harris, succeeding Dr. Harris as professor of Operative and Clinical Dentistry, a position he still held at the time of his death. According to Ross Kelbaugh’s Directory of Maryland Photographers 1839-1900, Richard Walzl’s studios, where Dr. L. Wilson Harris had his portrait taken, were located at the addresses indicated on the bottom of the cabinet card ca. 1887-1893. 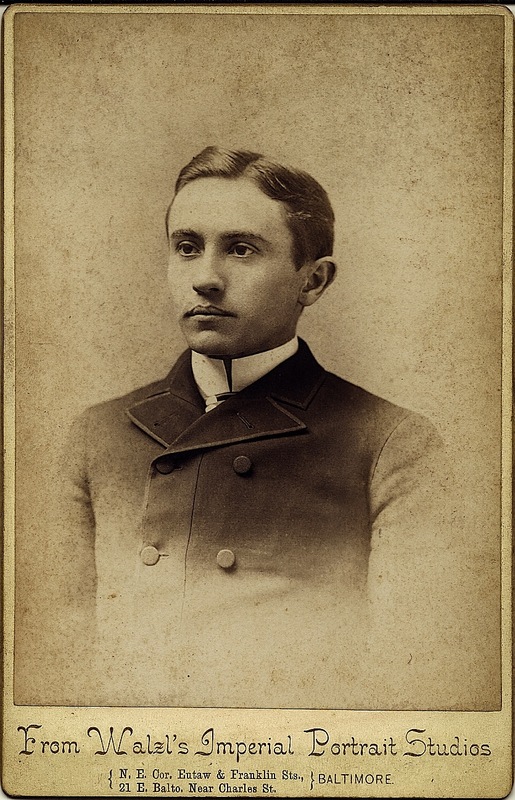 This photograph of young Dr. Davis may well have been taken on the occasion of his graduation from dental school in 1888.